St. Lawrence Martyr Church was originally established as St. Mary’s Church on the Feast of St Joseph, March 19, 1821 and is the fourth oldest Catholic Church in Massachusetts. 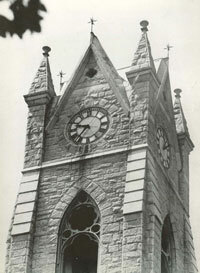 From the pitiful little wooden church mentioned in the diary of Bishop Benedict J. Fenwick of Boston, the congregation erected, to the glory of God, a magnificent granite structure with a bell and a clock tower. The church was designed by architect P.C. Keeley, who also designed St. Patrick’s Cathedral in New York. St. Lawrence Martyr is a memorial to the founding members and the generations that have followed who earnestly believed. The parish established a Catholic Cemetery, three parochial grammar schools, the first Catholic High School, and a Catholic hospital – all of which had been staffed by the Sisters of Mercy. The parish has been the seedbed of many priestly and religious vocations, even to today, as well as the site of a miracle attributed to St. Therese of Lisieux. In 1995 Blessed Teresa of Calcutta visited and worshipped at St. Lawrence. The convent of the Missionary Sisters of Charity is located directly across the street from the church. The territory originally encompassed in 1821 has been divided many times. St. Lawrence is the mother Church of the Diocese of Fall River. The parish continues as a stronghold of faith, promoting the principles of Catholicism throughout the community. We look forward to our bicentennial celebration in 2021! More details of St. Lawrence Martyr Parish history will be posted in the future!